The historic war saddles created by Joram van Essen and Wouter Nicolai have become our favourite saddles. In my personal case, the saddle that Joram made for my horse Maximilian has been instrumental in some of the more ambitious dressage training, as it helped my seat to such an extent that the horse went much better under it than any other saddle. The saddles seem much smaller than you would expect for either the man or the horse, yet they fit very well. This is one of the reasons most people working from photographs make the reproductions much too big. Having said that, some of the original saddles were for some very narrow (and/or small) horses. 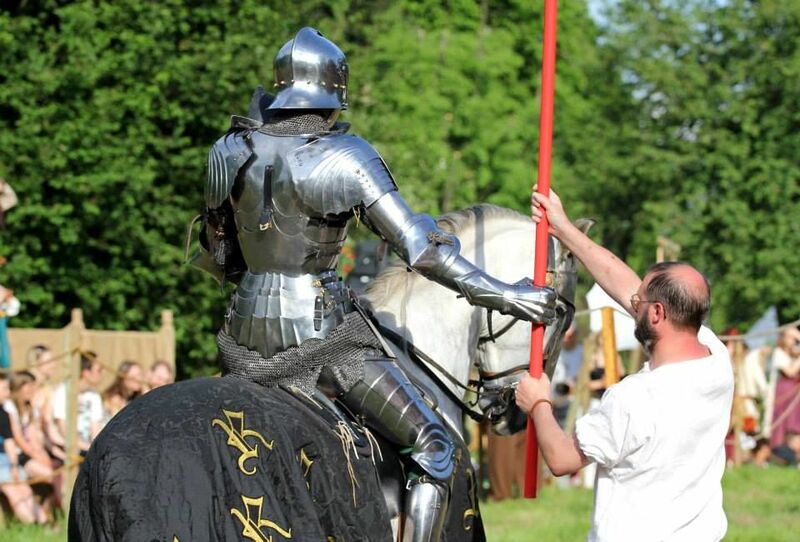 For instance, I myself am 193cm(apx 6' 4") tall, yet my saddle has a seat length of about 34 cm, (just over 13”), and when measured in the same way as a modern saddle, potentially less, yet it works fine, even with armour. 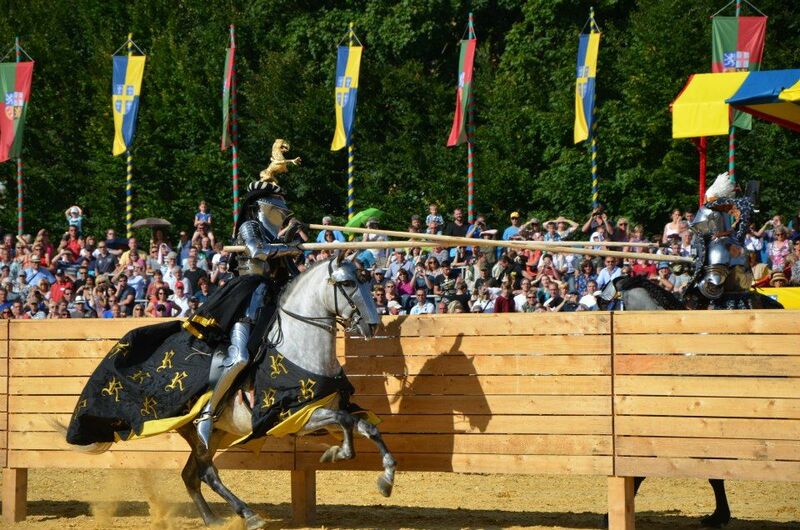 "A large contact surface means that the weight of the rider is divided over a much larger area, making it easier, and more comfortable for the horse to carry the (armoured) rider. This is especially true when a rider gets hit and transfers part of the force of impact to the horse (in the joust for example). In that situation, the historic war saddle is more efficient than any modern saddle to keep the horse safe from excessive pressure on the back. Furthermore, the solid seat is relatively narrow in front, allowing a slightly better angle of the rider's femur. Also, the slope of the front of the seat is such as to roll the riders hips back so as to sit in the center of gravity. In addition, the cantle is positioned to keep the center of gravity in the correct spot for the horses' anatomy. The front section of the boards comes down quite a lot, yet less then it looks like in photos of the originals when seen on display. This means that the front Arçon plate comes down the leg and provides support and helps (again) to open the hip, even better then modern dressage saddles hold the rider. When done correctly, the support around the front of the saddle allows mounting from the ground, even with no girth, without the saddle rocking precariously -- mounting from a step is always better for the horse -- but it is possible. Both front and back tree come down the sides of the horse, and they support the saddle in an impact so it does not rotate horizontally and thereby hurt the horse's loins. how much MORE knee action the horses offer (these saddles have adequate shoulder freedom, but particularly encourage the rider to sit more 'collecting' thereby giving greater freedom to the horse to throw his legs out from the driving back leg. The front allows much better interaction with the tassets and fauld. 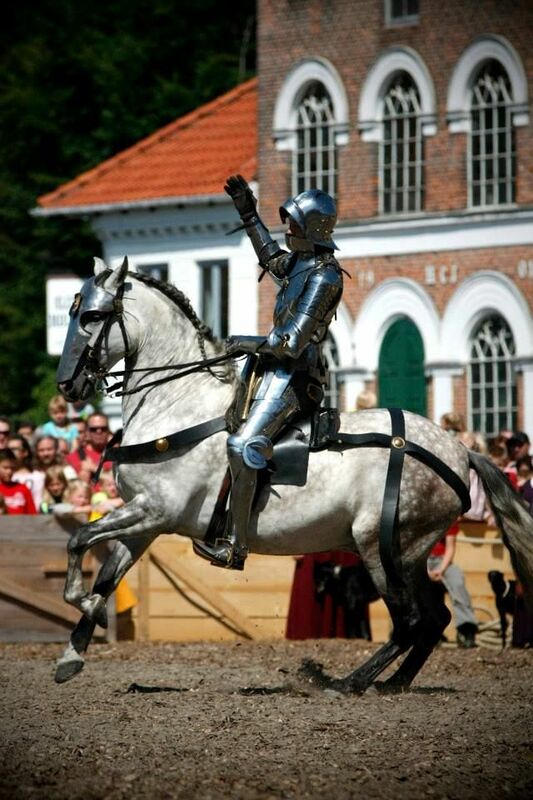 The armour is MUCH more quiet, both in terms of 'Tasset flap' and 'mail scratch'. The leg lies much better. 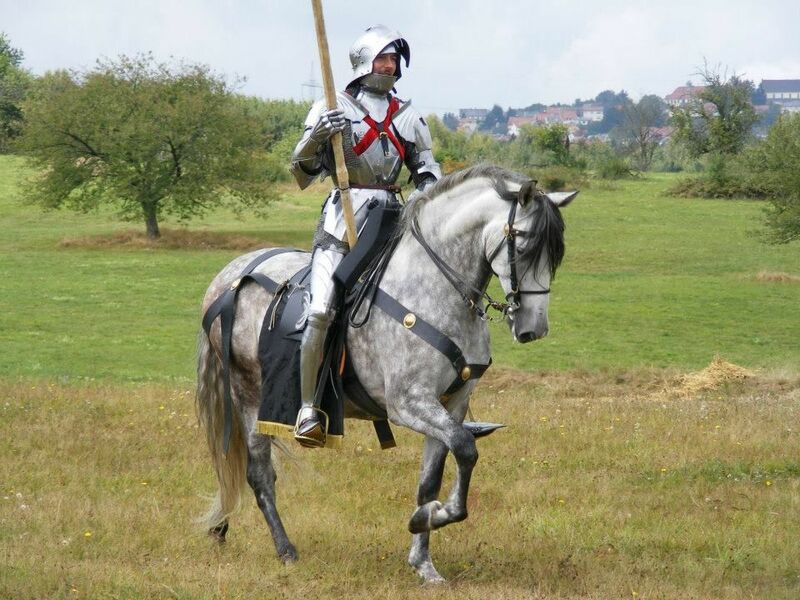 The cuisse can be pushed out by broad saddles, like Portuguese saddles, meaning that leg use in armour is almost impossible sometimes, whereas in these saddles one forgets one wears armour. how little the 'high' arçon plate impedes the rein hand, because it is not just bolted onto a saddle, thereby sitting much closer to the belly of the rider. These saddles are very short, overall, and thereby fit the short coupled horses we prefer quite well, yet many short modern saddles dig into the back. When they have a straight back edge it is clear, but with a dressage saddle it is less apparent but equally true. If you think about a dressage saddle, it is shaped like a rider's bum, yet the medieval saddle is shaped like the horse's loin. One of the final pieces to the puzzle was how to make sure you could fold back onto the horse, or put all your weight back, yet not dig into the horse's loin. This allows very deliberate use of the seat which helps a lot in more collected work. These war saddles work better for taller horses (15-16 hands or potentially larger) as opposed to the raised seat saddles, which to me seem conceived for smaller horses. The much lower (but still narrow) seat allows much closer feeling of the seat to the horse -- both more feedback and more opportunity for aids. This would fit well with the archeological record which shows Dutch finds of male horses of up to 161cm(apx 15.3 hands) height in a context of the siege of Utrecht in the second half of the fifteenth century, much(inches) taller than most evidence seems to point to in earlier periods. What is also surprising is how light these saddles are, (and how light un-armoured original examples are), they are generally less than half the weight of a regular GP[general purpose, in the US an AP(all purpose)] saddle, which is a nice bonus as we are already adding up quite a lot of weight with large riders and heavy armour with regards to the horses’ carrying capabilities. After this little rant it must be said that although I myself have been involved in the research, most credit must go to Joram van Essen and Wouter Nicolai with their repeated attempts and dogged determination to reproduce viable saddles with which to make these experiences, and in particular Joram's breakthrough in 2011, when all of the major problems disappeared in quick succession. Fabulous article! Where can I buy one of these saddles?? Hello. Loved these two articles, thank you. I'm a saddle fitter by trade. Where could someone see these saddles - preferably on a horse? So many of the elements of design seem sensible - especially for the horse - refreshing and exciting. As you say too many saddles these days are designed for the rider's bum first, and the horse's back second. If you can tell me what country you are in(and what area if it is a larger country), I might be able to help you find someone nearby who has one of these historic style saddles that you could examine.